Guinness, Chocolate and Potato Chips – Super Bowl Sunday! Hope everyone had a fun Super Bowl Sunday! The game ended on an exciting note . . . but of course you know I was only watching for the commercials, and for an excuse to bake more cupcakes. These two cupcakes draw inspiration from Chuao Chocolatier again, this time from one of their newer flavors, the “Potato Chips in Chocolate” bar. 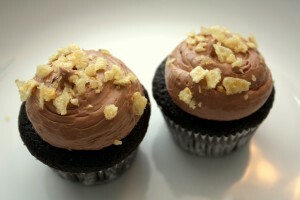 This first cupcake is a simple chocolate cake. I tried to work with an even simpler recipe than my prior chocolate cupcakes, in case I ever needed to pull it together with basic ingredients, and I think this one worked out well enough. The frosting is a Swiss meringue milk chocolate buttercream frosting, topped with crushed potato chips and some added sea salt. Mildly sweet with a bit of crunch. Combine the chocolate, cocoa, and espresso powder in a large bowl. Pour the boiling water over the chocolate mixture, cover, and let sit for a few minutes to help melt the chocolate. Whisk until smooth, then set aside to cool slightly, about 2 minutes. In a separate bowl, whisk the flour, baking soda, and salt together. Whisk the sugar, eggs, and vanilla into the cooled chocolate mixture. Slowly whisk in the oil. Whisk in the flour mixture in two portions, mixing gently until most of the lumps are gone (do not overmix). Bake for 20-22 minutes for regular cupcakes, or about 10 minutes for mini cupcakes. Combine sugar, egg whites, and salt in bowl of stand mixer; place bowl over pan of simmering water. Whisking gently until sugar is completely dissolved and mixture is slightly foamy. Place bowl in stand mixer with whisk attachment. Beat on medium speed until stiff peaks form. Add butter, about 1 Tbsp at a time, and beat until smooth. Then add cooled melted chocolate and vanilla; mix until combined. Increase speed to medium-high and beat until light, fluffy, and thoroughly combined. 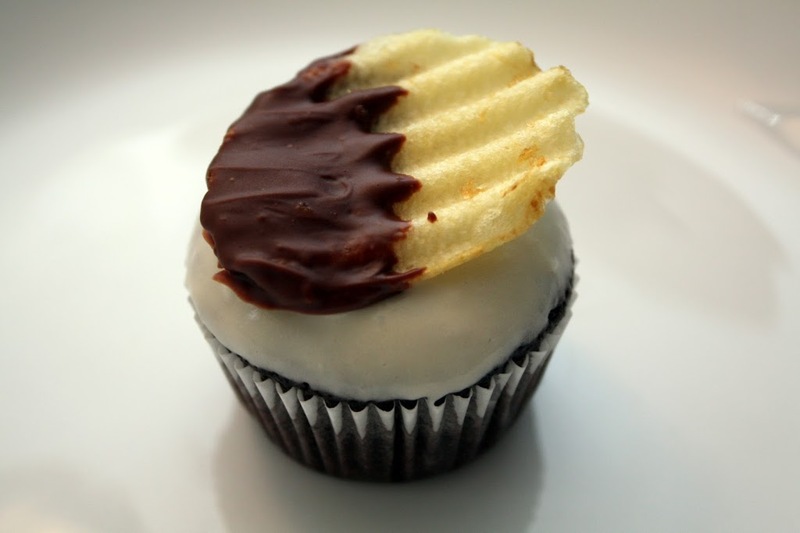 The second cupcake is a Guinness draught chocolate cake with a Guinness cream cheese glaze, topped with a potato chip dipped in milk chocolate. Because of the Guinness, this cake is a bit more bitter, but that makes for a nice contrast to the sweet glaze and salty-crunchy topping. In a large sauce pan over low heat, combine Guinness® and butter, stirring until butter melts. Remove pan from heat and whisk in cocoa powder and brown sugar. In a medium bowl, whisk together sour cream, eggs and vanilla. Combine with beer mixture. Sift together flour and baking soda, then fold into batter. Make the glaze. With a mixer, whip 8 oz. cream cheese until smooth. Sift 1 ¼ cups confectioner’s sugar into cream cheese, and beat. Add ⅓ cup Guinness®, and beat until smooth. Note: The recipe I found stops there; however, I added a stick of unsalted butter to provide for a sturdier frosting. 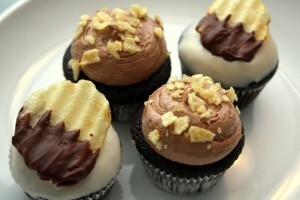 Dip the top of cupcakes into this glaze/frosting and twist when lifting for a smooth coating.